RTR Planeta, a Russian language channel broadcasting in Lithuania, has repeatedly run into conflict with the country’s television regulator. In December, the Lithuanian Radio and Television Commission ordered RTR Planeta to be moved to paid TV packages after it broadcast material that the agency said instigated racial hatred and warfare. The programme in question was the 29 November episode of Sunday Evening with Vladimir Solovyov, which discussed the downing of a Russian plane by the Turkish airforce. Russian MP Vladimir Zhirinovsky, who was a guest on the programme, said Turkish people were “a nation of wild barbarians,” and said that Turkey should be “brought to its knees” through military attacks. “We need an air raid on any part of Turkey (…), the Turkish army must be destroyed,” said Zhirinovsky. This is the second time the programme has prompted the regulator to take action. In April 2015, RTR Planeta was blocked from broadcasting for three months for allegedly “inciting discord and warmongering” over the conflict in Ukraine. The content in question included a tirade against the Baltic countries by ultra-nationalist Russian politician Vladimir Zhirinovsky on the Sunday Evening With Vladimir Solovjev programme. Zhirinovsky said that Poland and the Baltic states would be “wiped out” should a war break out between Russia and NATO. Although Lithuanian politicians and media experts agreed on the inflammatory nature of RTR Planeta content, especially the comments made by Zhirinovsky, some media pundits have expressed doubt over the decision to shut the channel down for three months. It resumed broadcasting on 13 July 2015. In April, Audris Matonis, news service director at Lithuania’s national LRT broadcaster, rejected criticism that the ban was excessive and amounted to censorship. He insisted that “all should realise that what they’re advocating is non-compliance with Lithuanian law”. Aidas Puklevičius, a journalist and author, insisted that the broadcast ban may not have been the best decision and reasoned that the situation should improve once the generation of people who speak only Russian as a foreign language gives way to one which is more fluent in English. 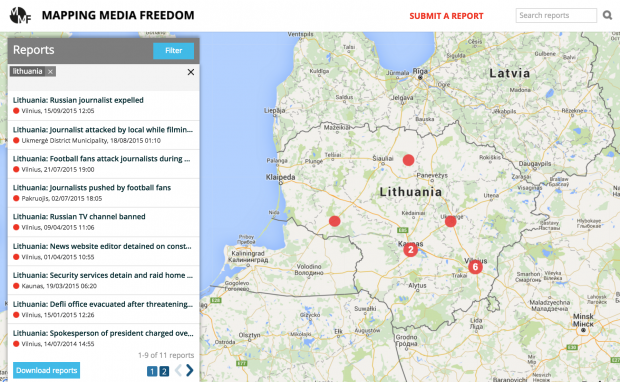 Media professionals in Lithuania have increasingly found themselves taking sides in the Ukraine conflict. The journalist said he had stopped watching Lithuanian TV news and has switched to German TV channels which air many different views on the conflict. In January 2015, Dainius Radzevicius, the chairman of Lithuania’s Union of Journalists, wrote a commentary piece in which he said “polarisation of the media is something we all have to admit is happening, and it has been very palpable for the last couple of years not only in the Lithuanian media but elsewhere too”. Radzevicius said the problem began as a result of economic conditions, but it is fueled by the geopolitical situation, including the conflict in Ukraine. “Against this backdrop, we may now have less of a variety of opinions on the radio waves, the TV screens or the newspaper pages; but it is necessary to resist the powerful and obtrusive propaganda coming from the East, therefore, what I call our ‘white propaganda’ is necessary during the times,” he said in the piece.